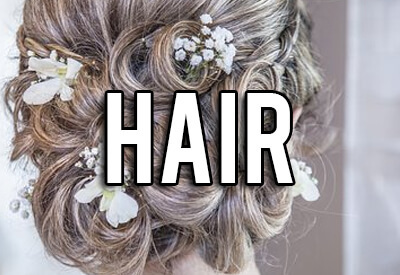 We realize that every bride wants to have a fetching hair style on their big day. Just relax. You should have your gown picked before you start thinking about your hairstyle. Your hair should never over power your gown. You and your dress are the main focus. Here are what we consider to be necessary tips to make finding a salon simple. Be realistic with yourself. If you have thick, curly hair then don't attempt anything sleek, chances are you will end up with a puff ball by the end of the night. If you have short hair, you can purchase hair extensions, this will give you extra volume and length. Your stylist should apply them for you. Never force your stylist into something they advise you against. Keep in mind that they are the professional and they know what's best. Talk to the people you are around on a regular basis. Find out if anyone you know has a hair stylist they would recommend. Use social media to your advantage. Create a post asking for suggestions on salons, with in minutes you will have multiple suggestions. Use search engines for salons you can often find reviews from past clients. Look in bridal/hair magazines for ideas. Print out your favorite and bring it to the stylist they will determine if it is something they can execute or not. Once you have done some research and have at least three hair stylists to check out, go visit them. Ask them about pricing and availability. Look around, what do you see? The salon should be clean. The staff should be professional and dressed appropriately. If the salon and stylist look sloppy, their work is probably sloppy as well. Be sure that they are using properly sanitized utensils while working in clients hair. Once you have selected a salon, schedule a trial. A trial is where you sit down with the stylist and talk about your needs, they do your hair exactly how they will do it at your wedding. This is the time to discuss any like or dislikes to ensure the stylist knows exactly how you want your hair on your wedding day. Be realistic with your self. Picking a stylist is tricky, and can be overwhelming. Do not stress over it. Follow the simple steps in this guide and finding the best salon for you should become an easy task. Congratulations on your engagement, and enjoy your beautiful hairstyle. Atlanta has a hair stylist that is going to make you look your best for your big day, now go out there and find that stylist.